Creativity is a gift. It is not a gift subject to design, but in everything we do! Find what you love and be creative in that field. I urge you, do not abandon your gift. 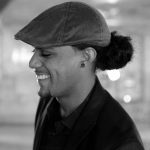 J Michael Smith is the founder and author of TGIFJ by Soaring Diamonds!